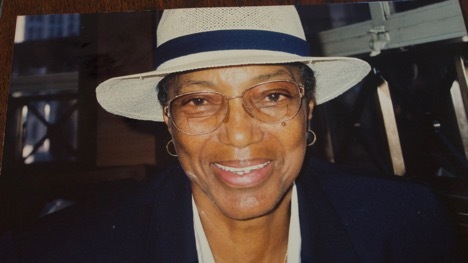 Former ATA champion and longtime tennis benefactor Arvelia Myers has passed away. As a giving and humble person, Myers used tennis as a release to come out of her shell and give back to her community. She first encountered tennis as she sat on the bench, watching her friends hitting balls with the round racquets. However, once Arvelia stepped foot on the courts, she never looked back. She started to play in the New York City parks tournaments but due to her reclusive personality, she was not very competitive at first. But thanks to the people around Arvelia motivating her to reach her potential, she started playing in the ATA (American Tennis Association). Not only did Myers play well, at one point she would be ranked No.3 overall and won the ATA women’s national doubles title in 1973. As great as she was on the tennis court, arguably her greatest achievements were off the playing surface. Tennis allowed for Myers to meet a number of people and build connections that she otherwise would not have. In 1973 Arvelia founded the Pyramid Tennis Association and influenced a number of the New York City youth. Myers taught kids the importance of having fun with the game while using tennis as a tool to build self-confidence in themselves. The intention was to instill belief in youth, particularly African Americans, that they could not only succeed in tennis but in life. Furthermore, under Myers tutelage, she made sure that the real goal for the children was to receive a proper education. 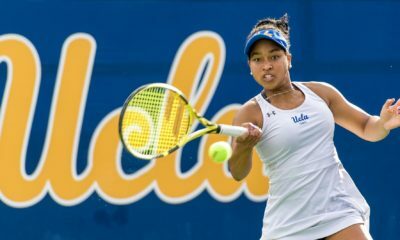 Arvelia was cognizant of the fact that not everyone can be a tennis champion but they can still be educated and gain a great deal with the sport. The young people in the Pyramid Tennis Association receive tutoring and are made sure that their grades in school are satisfactory. All of this is part of Myers’ plan to ensure that each student gets the chance to get a good college education. In addition to the Pyramid Tennis Association, Arvelia worked with a number of other programs in the city as she served as a role model and mentor for thousands of kids. Myers was one of the most loyal USTA volunteers as she would man booths every year at Flushing Meadows to spread the word to thousands of tennis fans every year. As an inspiration to us all, Arvelia devoted her life to helping everyone she possibly could with the help of tennis. She used tennis as a foundation to give back after the game had given so much to her. She will be missed deeply by the tennis community. A memorial in her honor is planned for December 9, 2017, 12 pm at Mt Morris, Ascension Presbyterian Church, 15, Mt Morris Park West, NY. When I asked tennis pro Julien Delaine if he knew Bobby Johnson Jr., the sparkle in his eyes told me the question had struck gold. “Yeah, man!” Julien said excitedly, adding that anyone who hung around the tennis courts at 16th and Kennedy streets in Washington, D.C., had to know Bobby Johnson Jr. and his three sons. They were fixtures on those courts back in the day. “He taught me how to kick the serve,” Julien said. The reason I asked was I recently had learned Robert W. Johnson Jr. had passed at age 92. 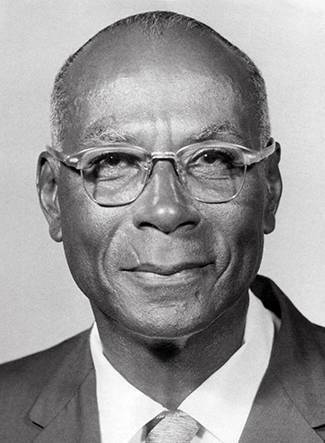 At the time, I knew little about him except he was the son of the legendary Dr. Robert W. (Whirlwind) Johnson, Dr. J., as he was called, who was inducted posthumously into the International Tennis Hall of Fame in 2009 for his role in breaking the color barrier in professional tennis and helping scores of young black tennis players develop their game. It was on the court at Dr. Johnson’s Lynchburg, VA, home where Althea Gibson polished the skills that propelled her to become the first black tennis player to win a Grand Slam tournament when she won the French Open in 1956. It was on that same court where Arthur Ashe honed the talent that led him to become the first black man to win a Grand Slam tournament when he won the U.S. Open in 1968. Both wound up winning multiple slams. I figured the passing of Dr. J’s son, popularly known as Bobby Jr., was worth a blogpost. But I needed to learn more about him. What I discovered was inspirational to say the least! Bobby Johnson Jr. was integral to Dr. J’s legacy, as he led the instruction of those invited to train Dr. J’s home academy over more than two decades. But Bobby Johnson Jr. also had established his own reputation in the black tennis community of the nation’s capital. Bobby Johnson Jr., who earned a master’s degree in biology from North Carolina Central University and studied medicine at the University of Lausanne in Switzerland, taught biology, chemistry and physical education in D.C. public schools. He coached high school tennis teams at Holton-Arms School in Bethesda and St. Alban’s in Washington. He also served as head tennis coach at Howard University. Bobby Johnson Jr. also competed. He and Dr. J won the father and son National Doubles Championships in 1955. And he played men’s singles in the U.S Tennis Championships at Forest Hills, the US Open forerunner, in 1958 and 1959. But Bobby Jr.’s passion was holding clinics for young black players throughout the District of Columbia, with his sons being among his primary students. Robert Johnson III, also familiarly known as Bobby, said his dad preached what he called the “classic” approach to tennis, marked by use of an Eastern forehand grip because of its flexibility to hit different kinds of shots. William Kellibrew, a city of Baltimore health official and a motivational speaker, would echo that. He told me he spent several years as a teenager under Bobby Johnson Jr.’s tutelage at the Turkey Thicket courts in the Brookland area of D.C.
D.C. native Merritt Johnson (no relation) said Bobby Johnson Jr. had a huge influence on his approach to coaching young players. Apparently, the teachings had an impact. Merritt Johnson was a two-time Washington Post Coach of the Year, as his girls’ team at St. John’s College High School won 8 of 9 championship matches while compiling a 112-1 record during his tenure. He also has Merritt, who also has competed on the USTA professional circuit, has been a juniors coach at several D.C. area tennis clubs. He has coached at George Washington University and the University of Arizona. He now is a high-performance coach in Seattle, Wash.
Bobby Johnson Jr. would hold clinics all over D.C. But his favorite site was Carter Baron at 16th and Kennedy streets. Bobby Johnson III said his dad would rent courts there during the summer and conduct camps for groups of kids, some of whose parents could afford to pay but did not. “It used to pain me to see my dad give away lessons for nothing, but he genuinely loved to help people,” Bobby told me. Julien Delaine told me he never could afford lessons, but he and his brothers who lived just a block away from Carter Baron learned just from watching Bobby Johnson Jr. train his sons. In its homage to Black History Month, the Tennis Channel is paying tribute to Dr. Robert (Whirlwind) Johnson in a video that includes clips from the 2009 Hall of Fame induction and last May’s ceremony for the refurbished tennis court at Dr. J’s home. There was no word of Bobby Johnson Jr.’s contribution to his dad’s legacy. Bobby Johnson III told me a memorial service is being planned for the Spring. Perhaps that will give rise to a campaign for the son of Whirlwind to have his own page in the annals of black tennis history. 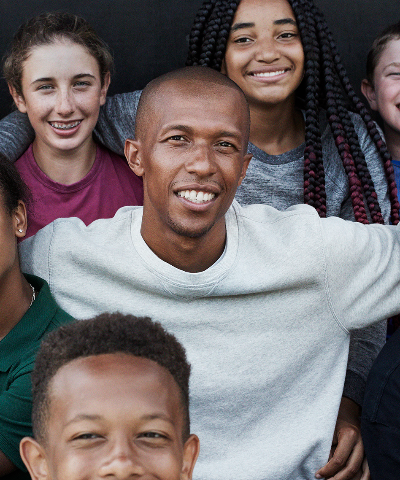 Kamau Murray keeps a tight calendar in the midst of coaching a top ranked WTA pro player (Sloane Stephens), managing a non-profit (XS Tennis & Education Foundation) and maybe now local politics. Chicago has been the basis for major overhaul recently as colleges and universities from around the nation pull resources together to held rebuild the neglected South Side streets of Chicago as part of the Clinton Global Initiative University. Chelsea Clinton was also accompanied by Mayor Rahm Emanuel for added support. “All of us have a responsibility to our fellow citizens, as Muhammad Ali said, the service to others is the rent we pay for our room here on earth,” Emanuel said. With such a big turnout, Kamau’s presence was required in Chicago leaving coaching duties to Sylvester Black. 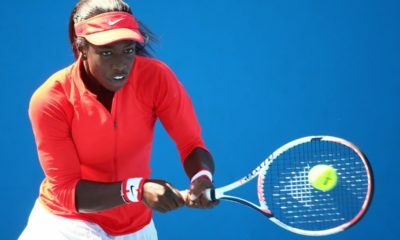 Sylvester was able to fill the role coaching Sloane quite well as he did double duty with on-court coaching igniting a turnaround from Sloane after losing eight straight games to eventually win her semifinal match against KarolínaPlíšková 6-1 in the 3rd set. With Sylvester backing him up, Kamau may have more opportunities to engage in the political scene of Chicago to make a real difference. The high crime and poverty stricken streets of Chicago could definitely use a sport like tennis to promote education and positive community development. 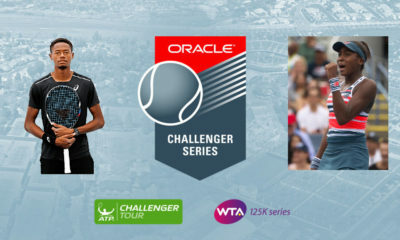 From saving the community, hosting the Oracle Challenger Series to grooming the next US Open champion, Kamau and XS Tennis are destined for continued success. For more info about Kamau and his efforts at XS Tennis Village click here. Today eight tennis courts at Harvard Park in Los Angeles got a major upgrade as the USTA teamed with Chase Bank to facelift five facilities across the country with new artwork by local artists and celebrities. Harvard Tennis Center had a share in the effort as a key NJTL cite for the event. This court resurfacing project was much needed within the community as more people outside of the sport see the Williams sisters playing on TV, but have no real connection to tennis in real life. These newly painted courts can be the spark needed to ignite tennis within a community that has been oftentimes forgotten. Marty Woods of Pete Brown Junior Tennis Program (NJTL) and Malcolm Johnson of Chase Bank partnered to make the effort happen. 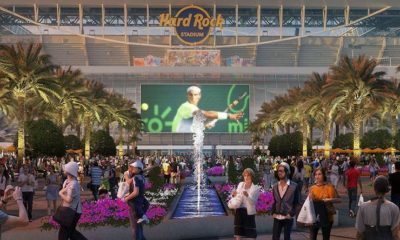 During the ribbon cutting ceremony speakers referenced a common theme – “continued effort” to boost tennis within the inner city. 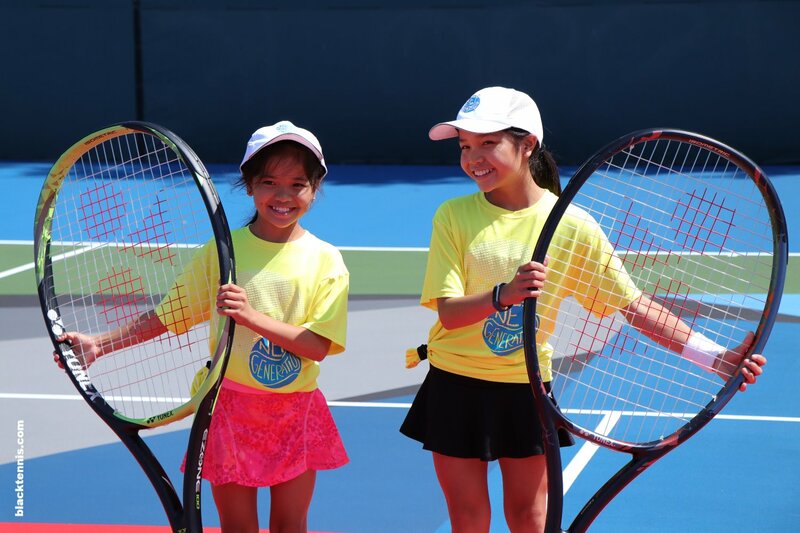 The USTA is making a concerted effort to promote the sport of tennis at the grass root level and the touch of art across five cities is a great way to spring the initiative across the country. The most important element of outreach is the follow up in regards to regular visits to the community and long lasting investments in the facilities, coaches and children within these junior development programs.